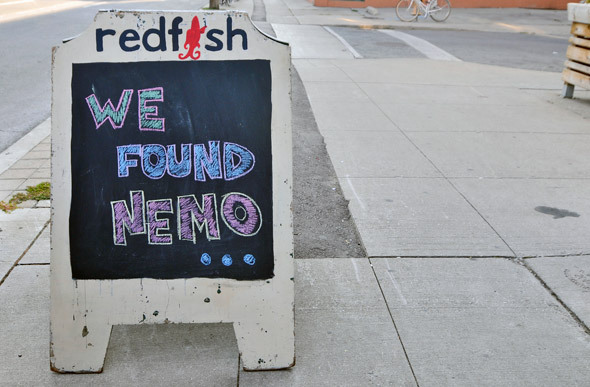 Red Fish, a new sustainable fish restaurant on College, may be decked out with white linens, but it's not trying to be some austere fine dining establishment. 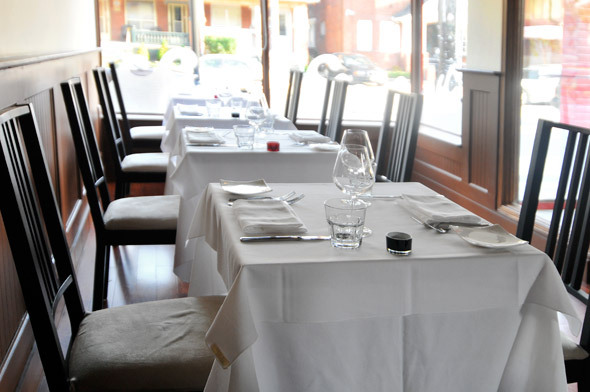 At first glance, the prices might seem a touch high, but chef David Friedman and general manager Jaime Duran (who met during a stint at Ossington's Fishbar ) credit this to their commitment to quality ingredients and an Ocean Wise approved menu. At Red Fish, fruit, veg and dairy all come from 100km Foods , meat is from Sanagans and seafood is sourced from Hooked or Daily . 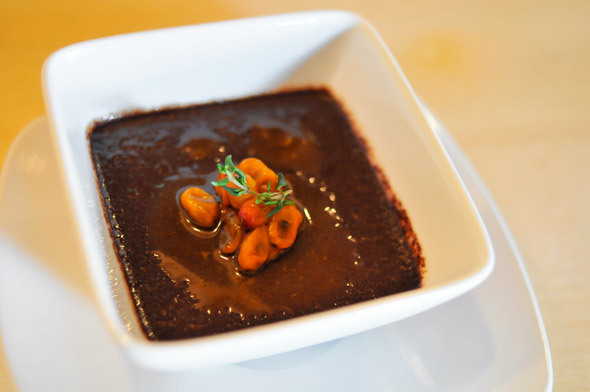 The menu changes based on availability but the focus is always on quality ingredients. Like the menu, much of the decor was locally sourced. Nautical motifs are studded throughout; life preservers from local artist Andrew Shay Hahn , commissioned metal sculptures and nautical charts from the nostalgic regions of Friedman's youth. The handsome dining room is warm, inviting and feels exponentially bigger than it did in its former life as Mitzi's on College . The Chef's Bored (market price), pun intended, offers a chance for both diner and chef to experiment and play. 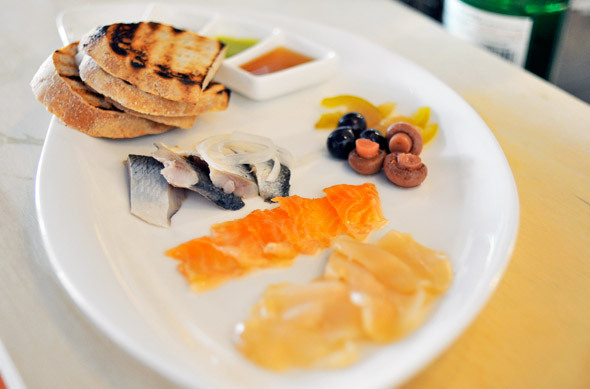 The presentation pulls heavily from traditional charcuterie boards, but here each fish is only lightly cured or brined. Tonight we are privy to a spread of smoky miso scallops, pickled herring, arctic char belly and an entourage of house-made bread, pickles and mustards. 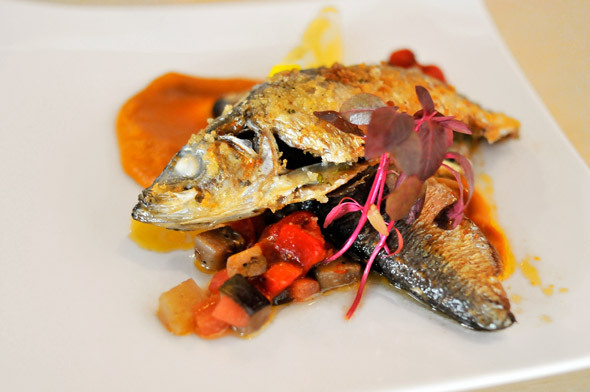 The Pan Fried Herring ($11) are stuffed with chermoula, a North African spice mixture (that is, in my opinion, all too uncommon on Toronto menus) and is served atop diced tomatoes, eggplant and veggie puree this is a delicious, light dish. Also delicate and light in the Rainbow Trout Ceviche (lead image), which keeps the dressing muted enough to let the fish shine. 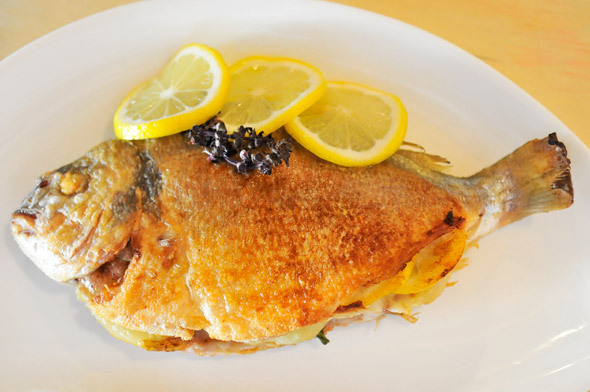 The Whole Sustainable Blue Sea Bream ($32) is golden brown and stuffed with potato, fennel and basil. It is beautifully plated and easily my favourite of the night. For dessert, the Pot au Creme ($8) comes topped with a tart sea berry compote supplied by a forager from the backwoods of Ontario. Never heard of sea berries before? Neither had I . 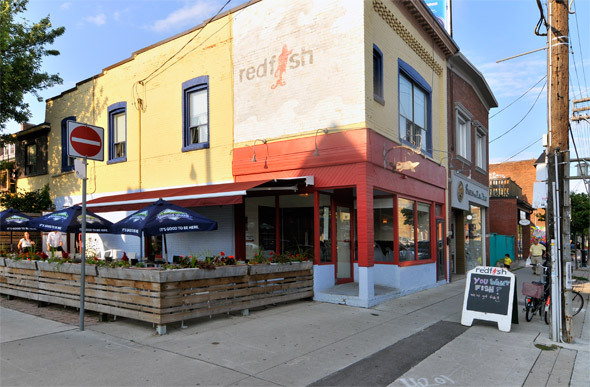 There is much to like at Red Fish, including the licensed patio and easy going staff, but what I'm excited about most are plans for a seafood brunch to launch later this fall. Already I've been baited with promises of homemade bagels and house-smoked fish.